is respected around the world for his distinguished career as a lawyer, scholar, and international diplomat. As secretary-general of the United Nations, he sought to reestablish the leadership role of that international organization in world affairs. Boutros Boutros-Ghali was born in Cairo, Egypt, on November 14, 1922, into one of the Egyptian Coptic-Christian community's most influential and wealthiest families. As a youth Boutros-Ghali displayed a sense of humor that remains a quality for which he is well liked. His father, Yusuf, at one time served as the country's finance minister, while a grandfather had been prime minister of Egypt from 1908 until his assassination in 1910. At a young age Boutros-Ghali learned about Western culture. His sophistication and fluency in English and French, in addition to Arabic, can be traced to his upbringing in an upper-class family and his formal schooling. After completing a law degree in 1946 at Cairo University in Egypt, he spent the next four years in France, earning diplomas in higher studies in public law and in economics, as well as a doctorate in international law from Paris University in 1949. Returning to Egypt, Boutros-Ghali became a professor of international law and international relations at Cairo University. During his twenty-eight years in university life he was a Fulbright scholar at Columbia University (1954–1955) in New York City, and director of the research center at the Hague Academy of International Law (1967–1969) in the Netherlands. He participated in many international conferences and delivered guest lectures at major universities abroad—from Princeton University in the United States to the Warsaw Institute of International Relations in Poland to Nairobi University in Kenya. His list of scholarly publications ran to more than one hundred articles on foreign policy problems and at least twelve books. Membership on the UN Commission of International Law (1979–1992) gave him a better understanding of the workings of that organization, and it would serve him well later in his career. Boutros-Ghali left university life in October 1977 with what proved to be an excellent sense of timing. Appointed Egyptian minister of state for foreign affairs, he accompanied President Anwar Sadat (1918–1981), who wanted to find a way to end the Arab-Israel conflict, on the historic journey to Jerusalem to meet with the prime minister of Israel on November 19, 1977. After this Boutros-Ghali attended the peace summit at Camp David in the United States the following September as part of the Egyptian delegation. During the 1980s he was involved in Egyptian politics as a leading member of the National Democratic Party and as a delegate to the Egyptian parliament. In May 1991 President Hosni Mubarak (1929–) promoted him to deputy prime minister for international affairs. Boutros-Ghali's deepening involvement in Egyptian national and external affairs ended toward the end of 1991, with the invitation to head the United Nations. Upon taking office in January 1992, UN Secretary-General Boutros Boutros-Ghali became the world's leading spokesman for, and practitioner of, internationalism (the goal of which is for countries to peacefully cooperate to solve problems). The new head of the UN viewed the end of the Cold War (the decades-long rivalry between the United States and the Soviet Union that saw each country significantly build up its military) and the example set during the Persian Gulf War (a war that began after Iraq invaded Kuwait in 1990) as presenting a historic opportunity for changing the nature of world politics. Boutros-Ghali used his position at the UN to call all countries and governments to fulfill the original 1945 UN pledge of a global political system. He held up the United Nations and its various agencies as an organization that could promote international peace and security, economic development, and human rights through international cooperation. But on the immediate and more practical level, much of his energy went toward putting the United Nations' own house in order. The secretary-general's ambitious list of UN-related goals included: making the organization more efficient and coordinating the efforts of UN workers in New York City with those in Geneva, Switzerland; making sure that the funding of the United Nations would be enough to meet the needs of the increased number and complexity of its missions around the globe; and strengthening the commitment of each of the more than 180 member states to the United Nations. The most important of Boutros-Ghali's goals was to broaden the United Nations' role of peacekeeping. His goal was to ensure greater effectiveness by the time of the United Nations' fiftieth anniversary in 1995. This program of reform made Secretary-General Boutros-Ghali a controversial figure in world affairs. He found himself having sharp political differences, not only with the United States and other Western governments, but also with UN military field commanders. This seemed uncharacteristic for the rather modest former Egyptian statesman and scholar. Nevertheless, he continued to commit the United Nations to searching for peace in Cyprus, the Middle East, Angola, Cambodia, and elsewhere. Indeed, that Boutros-Ghali was named secretary-general had surprised many UN experts, who generally dismissed him as too moderate and lacking personality. They saw his selection as a gesture toward developing nations, especially the fifty-one African countries that belonged to the United Nations. Noting that he was sixty-nine, they thought he would be more of a temporary caretaker than a voice for change for an action-oriented United Nations. But the secretary-general's critics apparently had underestimated his leadership qualities and inner resolve. Certainly, Boutros-Ghali's long public career and experience in international and Middle East diplomacy were impressive qualifications for the difficult position. Boutros-Ghali continued to be committed to bringing democracy to nations that had a history of conflict. He oversaw the stationing of more than seventy thousand UN peace-keeping troops during his years in office. 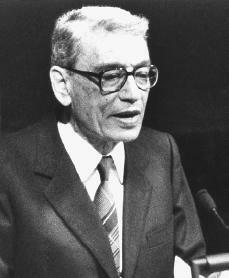 Boutros-Ghali remained willing to speak his mind until the end of his term in 1996. After leaving the United Nations, in 1997 Boutros-Ghali was named secretary-general of the International Organization of the Fran-cophonie. The organization has fifty-one member states that together make up the French-speaking world. In 2001 the University of Ottawa in Canada recognized the outstanding role Boutros-Ghali played in world politics by awarding him an honorary doctorate. Boutros-Ghali, Boutros. Unvanquished: A U.S.-U.N. Saga. New York: Random House, 1999.